SNES The Ninja Warriors (JPN) in 28:46.89 by Galedog. 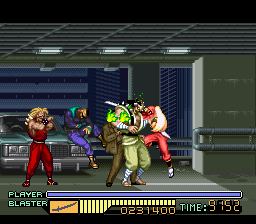 The Ninja Warriors is a beat-'em-up game for the Super Nintendo and Super Famicom, which blends the single-plane style of games like Kung Fu and Vigilante with more ambitious fighting mechanics from games like Streets of Rage and Final Fight. This tool-assisted speedrun aims to clear the Hard mode in the fastest time possible, and improves upon the previous TAS by 3:31.60 minutes. Improvements include better grouping of enemies for lengthy combos and efficient movement for optimal screen scrolling.